Fits great for both men and women. Our shoulder brace is designed to alleviate pain and discomfort in the shoulder area by providing support to the rotator cuff to improve stability. Made with 100% neoprene fabric and an extra-strength latching strap to ensure a comfortable, breathable fit that will not loosen during use. Great for strains, sprains, tendonitis, arthritis, subluxations, and other common shoulder, rotary cuff, arm, clavicle, ligament, tendons and muscle problems. 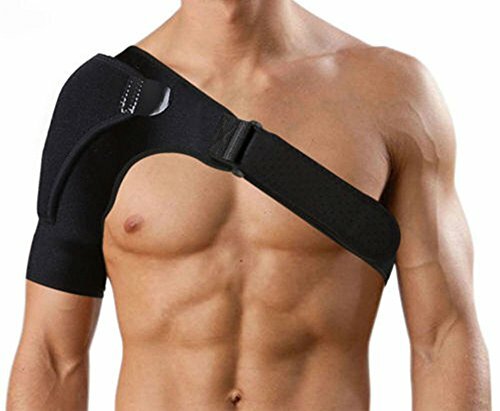 Click "Add to Cart" NOW And Purchase Your Own Shoulder Brace by Cruz Products. ✔️Relieve your pain - Our Shoulder brace will help you relieve pain and also protect your shoulder from injury by providing stability and compression which restricts unwanted movements. Which is perfect for sprains, shoulder dislocation, frozen shoulder pain, rotator cuff tear and more. ✔️BREATHABLE NEOPRENE - Premium neoprene for all day comfort. Temperature regulating to provide a soothing warmth yet still allowing air to circulate. ✔️EASILY ADJUSTABLE - Strong velcro straps and high quality plastic buckle design for adjusting on right or left shoulder, both for men and women. ✔️12-MONTHS MONEY-BACK GUARANTEE - We are confident you will love our product. If you are not 100% satisfied with our product we will buy them back from you at original purchase price for up to 12 months. If you have any questions about this product by Cruz Products, contact us by completing and submitting the form below. If you are looking for a specif part number, please include it with your message.